Five of the Little Orphan Annie broadcasts in this collection contain secret coded messages intended only for members of Annie's Secret Society. You can decode these messages by printing out and assembling your own personal 1936 decoder badge. Click on the 'Special Features' tab for simple instructions! August 5, 1925 marked the auspicious debut of one of the most popular comic strips ever to appear in newspapers: "Little Orphan Annie", created by cartoonist Harold Gray. It was originally titled "Little Orphan Otto" before Chicago Tribune owner Joseph M. Patterson ordered Gray to change the gender of the character, after observing that Otto looked "like a pansy." "Put skirts on the kid," Patterson barked and, lo and behold, "Annie" was born. By the time "Little Orphan Annie" was adapted for radio, premiering on WGN in Chicago in 1930, the comic was among the top five newspaper strips in the country. Annie would become one of the first radio serials to appeal directly to kids by focusing on adventures featuring kids. The Annie of the comic strips always seemed ill-at-ease among her peers but, on the radio show, she enthusiastically participated in kid-type behavior; in fact, one of the characters from an early continuity of the strip, Joe Corntassel, would continue to be featured as Annie's sidekick long after he disappeared from the newspaper version. (Corntassel was originally played by actor Allan Baruck, but the most famous individual to tackle the role was none other than "The Velvet Fog" himself, Mel Torme.) 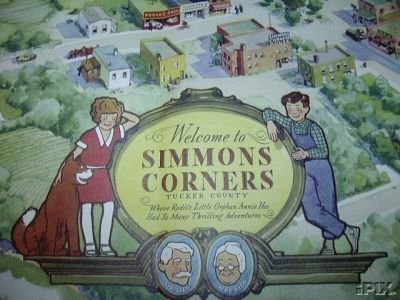 Many of the radio series' plots featured Annie and Joe being whisked away from their Simmons Corners surroundings to chase gangsters, pirates, cannibals and other nefarious types. "Daddy" Warbucks was also integral to the stories, but most of the time Annie was the responsibility of Ma and Pa (Byron and Mary) Silo, a rustic couple who kept an eye on young Annie while Warbucks was out concentrating on his ruggedly capitalistic pursuits. The head writer of the radio series, Frank Dahm, had a free hand in that he could either choose to follow Gray's strip or create situations of his own. By the time of Annie's radio debut, however, the strip had become a bit more geared to adults...and the parents of Annie's listeners expressed concern that the plots were a bit upsetting for younger ears, which forced him to tone down the stories. "It's Little Orphan Annie's very own Shake-Up Mug...with a beautiful, new and different picture of Annie and Sandy right on it. You put the special orange shake top on it when you shake up your ice-cold Ovaltine, then lift the top off, and presto! You have a special Little Orphan Annie to drink right out of. Here's the way to get it: take out all of the thin aluminum seal you find under the lid of a can of Ovaltine and mail it, together with ten cents -- one dime -- to cover the cost of mailing and handling, to the Wander Company, 180 North Michigan Avenue, Chicago, Illinois. Then, in a few days, the postman will bring you this brand new Little Orphan Annie Shake-Up Mug to have and to keep for your very own." Though the program was slavishly devoted to peddling as much Ovaltine as their Shake-Up Mugs could hold, the show discovered in early 1940 that the fickle Ovaltine was seeing other series behind its back. The popular children's drink mix had decided to hook up with "Captain Midnight" and "Little Orphan Annie" moved to Mutual on January 22, 1940, where it had appeared briefly between 1937-38, for Quaker Puffed Wheat Sparkies...originally at its 5:45 PM time slot, but soon moved to 5:00 PM. To add insult to injury, Annie ended up taking a backseat to the program's new main character, Captain Sparks (an aviator in the Midnight mold) and ended up as a merely a stooge/cheerleader for his daring wartime exploits. By this time, Janice Gilbert had replaced Shirley Bell in the Annie role and, because the Sparks character was simply a Captain Midnight clone, the program found itself unable to compete with the original. The show rang down the final curtain on April 26, 1942. Continuing our efforts to seek out and preserve the best, rarest, and most desirable broadcasts from radio's past, Radio Archives is pleased to offer this outstanding collection featuring the exploits of Annie, Joe, and all of her friends at Simmons Corners: 23 complete fifteen-minute episodes dating from 1936 and 1937, freshly transferred from excellent condition 16" World Syndication electrical transcriptions and professionally restored for outstanding audio quality. Radio Orphan Annie shows are extremely rare and, up to now, only a handful of shows have been available to collectors. We're very excited to be able to offer these recently discovered original broadcasts to radio enthusiasts everywhere - broadcasts that haven't been heard in over seventy years! A short history of Radio's Orphan Annie and her Decoder Badges. In the 1983 movie "A Christmas Story," little Ralphie finally received his long-awaited Orphan Annie decoder pin in the mail. When he rushed into the bathroom to decode the day's secret message, he was disgusted to find out that it said, "Be Sure To Drink Your Ovaltine." It was funny, to be sure. But it wasn't accurate. Contrary to popular myth, those secret messages at the end of the Orphan Annie radio shows never did promote Ovaltine. Oh, the rest of the show certainly did. There was an Ovaltine commercial before the start of the program, and another one at the end. The virtues of Ovaltine were extolled by announcer Pierre Andre twice in each quarter-hour episode. But Annie's secret messages, which appeared several times each week, were brief previews of what would happen in tomorrow's exciting adventure. Want proof? Well, now you can have it! Yes, now you can decode your very own messages from the 1936 episodes of Orphan Annie released by Radio Archives. You can find out what they really said. And you will find out that in actuality, they contain nary a mention of the sponsor's product. This Little Orphan Annie set offers four programs that contain secret messages from Annie that can be decoded using her 1936 Secret Compartment Decoder Pin. There are three more programs from 1938 that contain encoded messages that can only be decyphered using the 1938 Telematic Decoder Pin. Orphan Annie had other decoder pins over the years. The first decoder was released by Ovaltine in 1935. It was a small round pin with the year and "Radio Orphan Annie's SS" and two skeleton keys embossed upon it. The "SS" stood for "Secret Society." The following year, the pin changed to a badge shape with a secret compartment on the back. The two keys remained, but the words were shortened to the initials "ROA SS." The 1937 model decoder was probably the most attractive of the entire run. It was in a beautiful sunburst design with the now-standard year, two keys, and "ROA SS" on it. The next year brought the 1938 model, known as the "Telematic" decoder pin. It featured a larger circular pin with a large star on it. The two keys, year and initials "ROA SS" remained. In 1939 the Mysto-Matic decoder was given away. It was a plain circular decoder pin with a very large "ROA" in the center. The "SS" was removed, but "Secret Code" added. The two skeleton keys remained. The 1940 model decoder was a real beauty. It had an eagle, shield and American flag on the front, with 1940, the skeleton keys and "ROA" on the back. Each was individualized with a unique serial number stamped on the back. The numbers and letters appeared on the edge of the wheel, rather than on the front or back. By 1941, Ovaltine was no longer sponsoring Orphan Annie, switching instead to Captain Midnight. The 1941 model Orphan Annie decoder was made from paper because of the wartime shortage of metals. The "Slidomatic Radio Decoder" was offered by Quaker Puffed Wheat and Rice Sparkies, and was a far cry from the great old Ovaltine decoders. No more skeleton keys on the front. No "ROA" or "Secret Society." The final Orphan Annie decoder was offered in 1942, again by Quaker. It was the "Whirlomatic Radio Decoder" and was another boring paper decoder, dictated by wartime shortages. Orphan Annie left the air in that year, and there were no more Orphan Annie secret messages or decoders. In all of those decoders, there never was a ring. No decoder rings. The movie "A Christmas Story" got that part right, and used an actual 1940 Orphan Annie decoder badge as a prop. The decoder "ring" is just another common myth. Rings were just too small to fit all the necessary letters and numbers for a decoder. So they were usually larger pins and badges. The movie may have intentionally mislead the viewer regarding the actual decoded message just to get a laugh, but thankfully they did get the pin right. It should be noted that in the year 2000, Ovaltine did finally offer a decoder ring as a premium. Yes, an actual "ring" was used for the decoder. It was rather large and cumbersome, but it did fit on a ring. 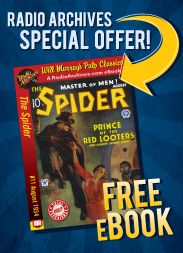 It was a mail-in promotion that lasted for about a year and required two proofs-of-purchase and $2.50. A far cry from "the thin round metal seal underneath the lid, and one thin dime." It should also be noted that the radio show always referred to "Orphan Annie" not "Little Orphan Annie." Only the comic strip used the word "Little." The decoder pins were always careful to specify "Radio Orphan Annie" or the initials "ROA." And exactly what messages did those decoders reveal? What secrets of Annie and her friends were transmitted over the air only for the ears of Secret Society members? You can find out. But only if you download your 1936 Orphan Annie decoder badge and use it to decode the messages on your six-CD set of radio episodes. We have provided two versions of the printable 1936 decoder badge. The first is a simplified version for those who want to start decoding quickly. Just cut out the number disc, pin it to the front of the badge and away you go. The second one is truer in function to the original and requires that you cut out small holes for each letter of the alphabet. The letter disc gets affixed to the back of the badge. Click the "1936simple.zip" link to download the easy-to-cut version, or click "1936authentic.zip" for the challenge version. Just click the appropriate link to start the download. The images supplied are jpgs. You may wish to import them into your favourite word processor or graphics program for resizing and printing. They are large enough to print at 300 dot per inch (giving you a 4 inch by 5 inch decoder). Some printers print RGB images very nicely, but you may want to convert these images to another format for better results. CMYK Tiff files are often a better alternative. If your printer allows it, we recommend you print on sturdier paper or even a card stock. Cut out your badge and decoder circle. The process is the same for both decoders. The second one requires the small square holes in the outer rim of the badge to be removed. It is recommended you remove these with and xacto knife. Be careful as these are razor sharp. You will need a brad or spit pin for the final assembly of your decoder. Affix a brad or split pin through the center hole of both pieces so that the circle rotates. Set the dial to the special code key described in the Orphan Annie episode you are listening to. Little Orphan Annie is an American icon on the order of Shirley Temple, Mickey Mouse and Snow White, all being extremely popular at the time. The Radio Archives staff continues in their great restoration projects of vintage radio shows from the Golden Age of Radio. This early radio program has been restored back to the original sound and tonal quality that would have been the case when the show initially aired on radio in the late 1930's and early 1940's. The explanation above regarding the decoders that were issued during the late 1930's and early 1940's is most interesting and very well explained with images of the actual decoders in color. One really needs a decoder to fully enjoy the show. 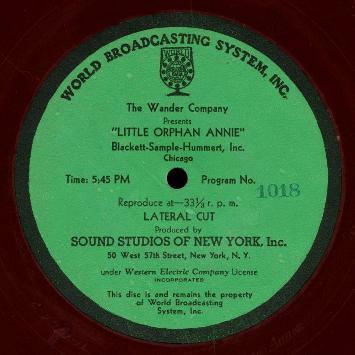 The cover artwork of Little Orphan Annie is very well executed by the artistic staff creating these images for Radio Archives. My late father often told me about listening to Little Orphan Annie as a kid, and the thrill of decoding the secret messages...only to discover that they were basically ads for Ovaltine and the show! He was also a fan of Jack Armstrong, Renfrew of the Mounties and The Green Hornet. this would have been a great gift for Dad, but he passed on about the time you folks started up. My mom is still around though, and I've gotten her several of your musical collections, which she listens to every day at her yarn shop. My kids and I enjoyed these Little Orphan Annie episodes a lot. Wonderful entertainment and as usual, the audio is so crisp and clear. We would love to hear another batch if you come across more episodes! The Orphan Annie CDs arrived yesterday. Thanks so very much, my Dad will really get a kick out of listening to them and working the codes. I received the Orphan Annie programs I purchased. It was indeed fast service and the discs are outstanding quality. If you keep offering this kind of service you will earn a reputation for fine quality and fast service--both very rare commodities in business these days. What a fabulous job you folks did with "Annie". It doesn't even sound like the same show, the sound quality is so much better. It's like the difference between seeing a picture of the Mona Lisa taken from 8 feet away, and seeing it up close and in person at the Louvre. Anyone who is a true fan of Old Time Radio MUST purchase shows from Radio Archives. You folks bring the hobby to new heights! Bravo!